one photo, no words. sharing a special moment of the week i'd like to treasure and remember. wishing everybody a very lovely, sunny first weekend of spring!! Talent runs in the family :) I hope you have a fun filled weekend! Now THAT'S an artist!!!! Cute! Our moment this week comes from our first clothesline drying day of the season! Can't believe how incredibly warm it has been this week and couldn't miss the chance to take advantage of this gorgeous weather! Wonderful!! I love seeing the creativity the little one's come up with. Have a great weekend! 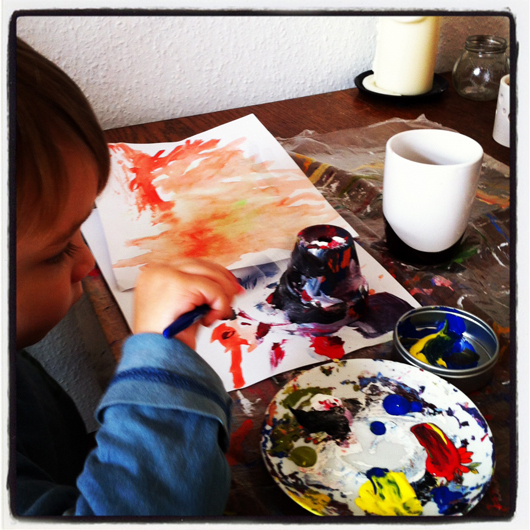 Looks as though the love of art runs in the family... Lovely moment! Some of my favorite clay pots are the ones my boys have decorated. Enjoy your weekend! Wonderful! I love the intensity of children and their art. I wonder what is waiting to be placed in that tiny pot? hey, how fun! i've got a new painting buddy!! Oh, how sweet! I wish I had a flowerpot like that!